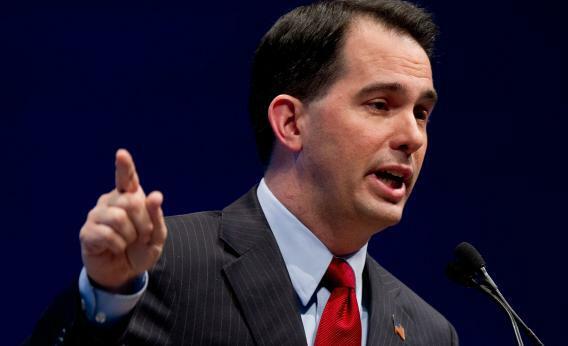 Scott Walker: Recalling the Wisconsin governor could swing the 2012 presidential election. Wisconsin Gov. Scott Walker speaks during the NRA’s Celebration of American Values Leadership Forum on April 13, 2012 in St. Louis, Mo. In mid-January, Wisconsin Democrats unloaded 128 cardboard boxes from the back of a moving truck outside the Government Accountability Board, which is just around the corner from the state capitol that served as a stage for last summer’s epic legislative fight over union bargaining rights. Democrats were optimistic about the boxes’ contents, reams of petitions to set in motion the process that will subject the state’s governor, Scott Walker, to a recall vote. When, two months later, the board formally accepted the petitions, they confirmed that the truck’s arrival had consummated a staggering feat of political organizing: 900,039 valid signatures collected by 35,000 unpaid volunteers over two months. That was well over one and a half times the number required to trigger a statewide recall ballot, and nearly matched the number of votes the Democratic nominee for governor received in 2010. Walker won that election with only 1.2 million votes cast in his favor. Usually such information comes at great cost, and especially so in Wisconsin. Voters do not register with a party and can participate in either primary, although unlike in many states with similar laws, no record is kept of which ballot they choose. The only way to confidently sort individual voters by partisan attitudes is to contact them individually and ask. Wisconsin Republicans worked out early deals with conservative allies who would identify voters’ positions on key issues, like abortion, guns, and taxes, and add the information to voter lists. But many of the groups were restricted by the tax code from asking about partisan campaigns, and a sequence of uncompetitive statewide elections in the middle of the last decade meant few Republican organizations had the resources to do the work on their own. Campaign tacticians faced similar problems in Michigan, which also doesn’t permit registrants to associate with a party. In the early 1990s, Mark Grebner, an East Lansing consultant who had created the state’s first voter file during the previous decade, decided to see if he could find clues in the reams of petitions submitted by candidates looking to qualify for the ballot and activists seeking to place issue questions there. The documents tended to stack up at the offices of local election authorities, largely unexamined; when people looked closely at the names and addresses, it was usually to disqualify an opponent from running. Grebner flagged the records of voters who had signed different petitions and set out to see what he could learn about the signers’ political attitudes. Signing a petition, after all, was not the same as calling yourself a Democrat on a registration form or picking a Republican ballot in an open primary. In fact, it represented a political behavior entirely detached from voting: just because someone will succumb to a petition gatherer when accosted at a supermarket doesn’t mean he will make a special trip to an elementary school on a Tuesday evening to cast a ballot. Signing a petition is no commitment to policy, only an endorsement for it to come up for later consideration, and even when a signature plainly backs a partisan cause, like Walker’s recall, it’s not quite a vote: There are no limits to how many petitions a voter can endorse, making a signature nonexclusive. A voter can theoretically sign simultaneous petitions to legalize gay marriage and ban gay marriage, and do so in good faith. Grebner began making petition information a staple of his voter file, digitizing images of petitions and sending them to Bangalore firms to reduce the cost of processing costs to around 5 cents per signature. When Grebner expanded his franchise to Wisconsin in 1999, he replicated the practice there—and the last year’s convulsions in the state’s politics have created a bonanza of new signatures for him to analyze. “The recall eruption is a whole new thing in Wisconsin, providing a large amount of accurate data in a state where partisanship is very hard to discern from public records,” Grebner says. Both Democratic and Republican party officials have come to similar conclusions through private research. When Democrats submitted petitions to recall three Republican state senators who had backed Walker’s agenda, the RNC commissioned a poll of those who had signed them. Close to 90 percent of respondents identified as sympathetic to the Democratic cause. “Everyone who signed this thing knew what they were signing,” says Wiley. As a result, according to Wiley, Republican Party operatives have removed all voters who signed petitions to recall Walker from their list of get-out-the-vote targets for Romney and a yet-undecided candidate in the state’s open Senate race. (Republicans will select their nominee to face Congresswoman Tammy Baldwin in an August primary.) Even those Wisconsinites who otherwise look like reliable Republican supporters—maybe they live in heavily Republican suburb, were identified as John McCain backers in 2008, or support conservative causes—are approached skeptically if they petitioned for Walker’s recall. Some will be targeted with mail or phone calls persuading them to vote Republican; others could end up ignored altogether. “We just don’t want to take any chances of turning out anyone who signed a petition,” says Wiley. Indeed, Grebner is finding that the act of signing a petition may itself make someone more likely to vote. Last year, his firm Practical Political Consulting participated in a campaign to recall Michigan state representative Paul Scott, a Republican allied with the state’s new governor Rick Snyder. Over the summer, organizers collected 11,047 valid signatures from voters in the Flint-area district. On election day in November, Scott became the first Michigan legislator to be recalled from office in nearly three decades. Grebner looked at whether the petition signers had turned out at a different rate than other voters. He found that just signing the petition had increased an individual’s likelihood of voting by 10 to 21 points. When he had carried petitions himself, Grebner had seen his request for a signature open up a conversation with his targets, the type of meaningful exchange that often eluded canvassers who merely greeted voters with an election-day reminder or handed off a piece of literature. “By spending three minutes on a doorstep, I may convert somebody into a long-term supporter,” Grebner wrote in a blog post. Soliciting a signature was likely a better way of winning a vote than asking for it directly.